File image of First lady Michelle Obama, joined by school children from Washington area on Tuesday, Oct. 6, 2015, at the White House in Washington. A bipartisan Senate agreement would revise healthier meal standards put into place over the last few years to give schools more flexibility, easing requirements on whole grains and delaying an upcoming deadline to cut sodium levels on the lunch line. While legislation released by the Senate Agriculture Committee on Monday would placate some schools that have complained the rules are burdensome, it is greatly scaled back from an unsuccessful 2014 House Republican effort to allow some schools to opt out of the rules entirely. The panel is scheduled to vote on the measure Wednesday. At the same time, GOP presidential candidate Chris Christie made it clear that not everyone is willing to compromise on the issue. The New Jersey governor, who in his struggle with his weight underwent lap-band surgery in February 2013, told an Iowa town hall Monday that the first lady "has no business" being involved in the school lunch debate. "I think that this intervention into our school system is just another example of how the Obamas believe that they've got a better answer for everything than you do," Christie said. The rules phased in since 2012 set fat, calorie, sugar and sodium limits on foods in the lunch line and beyond. They also require more whole grains, fruits and vegetables. Schools have long been required to follow government nutrition rules if they accept federal reimbursements for free and reduced-price meals for low-income students, but the new standards are stricter and some schools have said they are unworkable. The School Nutrition Association, which represents school nutrition directors and companies that sell food to schools, has led the fight to scale back the Obama administration's requirements. The group said it is supportive of the agreement negotiated by Senate Agriculture Chairman Pat Roberts, R-Kan., and the committee's top Democrat, Sen. Debbie Stabenow of Michigan. "In the absence of increased funding, this agreement eases operational challenges and provides school meal programs critical flexibility to help them plan healthy school meals that appeal to students," the association's president, Jean Ronnei, said. The White House has yet to weigh in on the compromise, but Agriculture Secretary Tom Vilsack backed the legislation in a statement. "The Senate's bill ensures progress will continue improving our children's diets, and it promises to end partisan battles about the future of our kids," Vilsack said. The five-year Senate legislation would direct the Agriculture Department to revise the whole grain and sodium standards within 90 days of the bill's enactment, meaning the new rules could be in place by next school year if Congress acts quickly. Under the agreement between those negotiating the bill, the new rules would scale back the whole grain standards to require that 80 percent of grains on the lunch line must be whole grain rich, or more than half whole grain. Currently, all grains are required to be whole grain rich, though some schools have applied for waivers. The nutrition directors say that kids don't like some of the whole grain pastas, biscuits, grits and tortillas. In addition, the agreement would delay stricter standards on sodium that are scheduled for the 2017 school year. They would now be delayed two years, and a study would measure the benefits of those reductions. The legislation would also require the government to figure out ways to reduce waste of fruits and vegetables and put more resources into summer feeding programs. The compromise seemed impossible just a year and a half ago, when the School Nutrition Association backed the House GOP effort to allow schools to opt out of the standards. 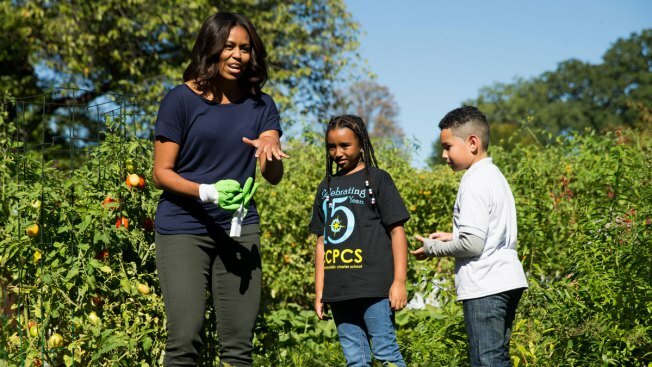 The first lady held an event at the White House to lobby for the rules, calling out the School Nutrition Association by name. She said she would fight "until the bitter end" to keep the rules intact.